Heparins act by greatly enhancing antithrombin’s inhibition of coagulation factors. Heparins are used at high dose to treat systemic thrombosis and at lower doses for thromboprophylaxis. New low molecular weight heparins (LMWH) have more predictable pharmacokinetic profiles and longer duration of action than unfractionated heparin (UFH), but are much more expensive. Unfractionated heparin (UFH) is a heterogeneous mixture of glycosaminoglycans consisting of polysaccharide chains of highly variable length. Heparin interacts with antithrombin (AT) to increase its affinity for its target serine protease coagulation factors, particularly thrombin (Factor IIa) and Factor Xa. The A domain of heparin, a specific pentasaccharide sequence, binds to AT. Once bound, the AT-Factor complex is cleared from circulation. The long chains also mediate UFH’s interactions with numerous plasma proteins, platelets, endothelial cells and macrophages. This extensive protein and cell binding, dependent on saccharide chain length, produces a complex pharmacokinetic profile and a wide variation in UFH anticoagulant effect between individuals and during the course of disease. The newer heparins are produced by depolymerization of UFH. The resultant molecules average about 15 monosaccharide units per chain with average molecular weight 1/3 that of UFH. These shorter chains reduce binding affinity for plasma proteins and cells, resulting in a longer half-life and more predictable dose-response. The shorter chains also reduce the formation of a ternary complex among heparin chains, AT, and thrombin, so that LMWH primarily inactivate Factor Xa. Veterinary dosage guidelines have not yet been defined. Recent studies indicate that adjusted dose UFH may be more effective than fixed dose therapy for canine IMHA and that LMWH has shorter half-life in dogs, cats, and foals than in people (each linked torefs below). 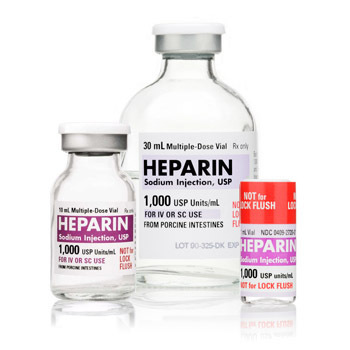 All patients receiving heparin should be closely examined to detect disease progression, or signs of bleeding and bruising, the major complication of heparin therapy. Clotting time tests (ACT and aPTT link to aPTT test) assess UFH anticoagulant effect, and can be used to detect excess anticoagulation before clinical signs develop. Target prolongation for high dose UFH therapy is 1.5X to 2X clotting time of the patient's baseline value. Clotting time tests are not useful for monitoring LMWH. Kidd L, Mackman N. Prothrombotic mechanisms and anticoagulant therapy in dogs with immune-mediated hemolytic anemia. J Vet Emerg Crit Care 2013;23(1):3-13. PubMed PMID: 23356703. Helmond SE, Polzin DJ, Armstrong PJ, Finke M, Smith SA. Treatment of immune-mediated hemolytic anemia with individually adjusted heparin dosing in dogs. J Vet Intern Med. 2010;24(3):597-605. PubMed PMID: 20384956. Swann JW, Skelly BJ. Systematic review of evidence relating to the treatment of immune-mediated hemolytic anemia in dogs. J Vet Intern Med. 2013;27(1):1-9. PubMed PMID: 23279007. Smith SA. Antithrombotic therapy. Top Companion Anim Med. 2012;27(2):88-94. PubMed PMID: 23031461. Lunsford KV, Mackin AJ, Langston VC, Brooks M. Pharmacokinetics of subcutaneous low molecular weight heparin (enoxaparin) in dogs. J Am Anim Hosp Assoc. 2009;45(6):261-7. PubMed PMID: 19887383. Breuhl EL, Moore G, Brooks MB, Scott-Moncrieff JC. A prospective study of unfractionated heparin therapy in dogs with primary immune-mediated hemolytic anemia. J Am Anim Hosp Assoc. 2009;45(3):125-33. PubMed PMID: 19411648. Brooks MB. Evaluation of a chromogenic assay to measure the factor Xa inhibitory activity of unfractionated heparin in canine plasma. Vet Clin Pathol. 2004;33(4):208-14. PubMed PMID: 15570557..
Fiakpui NN, Hogan DF, Whittem T, Green HW 3rd, Shipley EA, Sederquist KA. Dose determination of fondaparinux in healthy cats. Am J Vet Res. 2012;73(4):556-61. PubMed PMID: 22452504. Alwood AJ, Downend AB, Brooks MB, Slensky KA, Fox JA, Simpson SA, Waddell LS, Baumgardner JE, Otto CM. Anticoagulant effects of low-molecular-weight heparins in healthy cats. J Vet Intern Med. 2007;21(3):378-87. PubMed PMID: 17552440. Tennet-Brown BS, Epstein KL, Whelchel DD, Giguère S. Use of viscoelastic coagulation testing to monitor low molecular weight heparin administration to healthy horses. J Vet Emerg Crit Care 2013;23(3):291-9. PubMed PMID: 23656212.
de la Rebière de Pouyade G, Grulke S, Detilleux J, Salciccia A, Verwilghen DR, Caudron I, Gangl M, Serteyn DD. Evaluation of low-molecular-weight heparin for the prevention of equine laminitis after colic surgery. J Vet Emerg Crit Care 2009;19(1):113-9. PubMed PMID: 19691592. Guervil DJ, Rosenberg AF, Winterstein AG, Harris NS, Johns TE, Zumberg MS. Activated partial thromboplastin time versus antifactor Xa heparin assay in monitoring unfractionated heparin by continuous intravenous infusion. Ann Pharmacother. 2011 45(7-8):861-8. PubMed PMID: 21712506. Price EA, Jin J, Nguyen HM, Krishnan G, Bowen R, Zehnder JL. Discordant aPTT and anti-Xa values and outcomes in hospitalized patients treated with intravenous unfractionated heparin. Ann Pharmacother. 2013;47(2):151-8. PubMed PMID: 23386070. Hirsh J, Bauer KA, Donati MB, Gould M, Samama MM, Weitz JI; American College of Chest Physicians. Parenteral anticoagulants: American College of Chest Physicians Evidence-Based Clinical Practice Guidelines (8th Edition). Chest. 2008 Jun;133(6 Suppl):141S-159S. PubMed PMID: 18574264. What sample type is required for heparin assays? What is the turnaround time and cost for heparin assays? When should I draw samples for heparin monitoring? What is the test request for unfractionated heparin monitoring? What is the test request for dalteparin or enoxaparin monitoring? How can I use heparin anti-Xa assays to guide anticoagulant therapy? What is the target range for unfractionated heparin (UFH)? What is the target range for low molecular weight heparin (LMWH)? Are anti-Xa assays the same as Factor X activity assays? Separated citrate plasma (plasma from a blue top tube) is the only valid sample. DO NOT SUBMIT SERUM OR HEPARIN PLASMA. Ship at least 0.5 mL of plasma in an insulated box with cold packs for overnight delivery. See the sampling page for detailed sampling instructions. Heparin assays are performed daily and results reported same day as sample receipt. Refer to the AHDC test/fee list for current pricing. Trough heparin (all species): Sample for trough heparin levels just before the next scheduled dose. What test should I request to monitor unfractionated heparin (UFH)? Use test code HEP for unfractionated heparin. What test should I request to monitor low molecular weight heparins such as dalteparin and enoxaparin? Use test code LMWHEP for low molecular weight heparins such as dalteparin (Fragmin) and enoxaparin (Lovenox). Heparin anti-Xa assays measure the patient’s circulating levels of heparin based on specific inhibition of Factor X. High anti-Xa activity indicates high heparin anticoagulant effect. Target anti-Xa ranges developed for people can offer guidelines for animals. What is the target anti-Xa range for unfractionated heparin*? What is the target anti-Xa range for low molecular weight heparin*? NO. The anti-Xa assay detects heparin in patient plasma based on inhibition of Factor X in an assay reagent. Factor X assays (Factor X:C or Factor X coagulant activity) measure a patient’s endogenous level of functional Factor X.